This is my first post and I hope to find an answer in regards to a video I have posted on Youtube. It shows the brilliant Ronald Searle at work with his fountain pen. Curiously he uses the back of the nib to create thick outlines with a very 'wet' inkflow. Searle was famous for using Montblanc pens but I have not come across a model that allows you to do what Searle does in the video. Does anyone here know of any pens that allow this? I've been searching for a long time now and never found an answer. Hopefully someone here can help? given the time period, he may very well have had his nibs custom-tuned to do this. that's still an option today, of course. Thank you for your reply. I had a Montblanc pen customized to increase the flex and the inkflow. But it won't work with the back of the nib. I knew Ronald personally in the last few years of his life and he always mentioned that he would use the back of the nib as if it was the normal thing to do. He never mentioned customizing. I wish I had asked him at the time. YOU KNEW RONALD SEARLE! Forgive the shriek of amazement. I adore, adore, adore Nigel Molesworth, the curse of St. Custards! More anecdotes? I have given so many Willans and Searle as gifts. I can recite The Hogwarts from memory. Of course it is elegantly terse -- Oh happy day, that FPN has a new member (welcome) who knew the great illustrator! I have a Parker 45 in medium nib that writes like a fine upside down. It was really rough at first, but I smoothed it and worked it to the point that I now basically have two pens in one. That almost looks like a dip pen, though it's quite difficult to see. It doesn't look like a MB. As an illustrator myself, I can imagine it might be easier to use the back of a pen for thicker, more fluid lines, to keep things lively, than changing to a brush and chopping and changing. My second cousin was Robert Stewart Sherriffs (Punch, Radio Times, Daily Express etc) and he often used a mixture of brush and mapping pen. Perhaps this was just a life long habit that effectively 'customized' his pens to his hand? What a treat to see him working, though! Great man. Edited by missuslovett, 16 December 2015 - 00:34. My very first fountain pen since becoming actually hooked on them this year was a Zebra that I bought at Walgreens. The only way that I could get it to write even halfway consistently was upside down. Ronald used fountain pens for all his reportage work, where he would draw on the spot. In his studio he often used dip pens and I have a whole box full of pens he gave to me in 2010. This Aikin nib looks interesting. I'll try and find one. Many thanks for the tip! What a wonderful series of first-hand recollections! 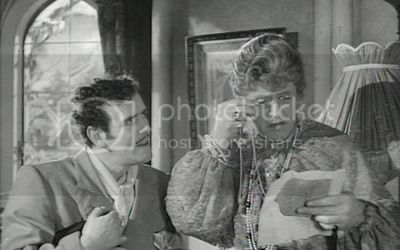 Flash Harry (George Cole) and Headmistress Milicent Fritton (Alastair Sim) in The Belles of St Trinian's (1954 London Films in association with British Lion Film Corporation Limited)] Ronald Searle appeared in a scene as a visiting parent. If it's a (relatively) flexible German pen of a certain age, he may be taking advantage of the resiliency of the point to do stuff that isn't quite in the owner's manual, not unlike making the Kessel run in less than 12 parsecs or doing an outside loop in a Sopwith Camel; most people can't, few would think to try, but for a talented and lucky handful it is possible. That's definitely a fountain pen in the video. I've made vast swipes with the back of a pen by rolling the paper over the edge of a table and moving the pen sideways, but I've never tried what's shown (wanting in both luck and talent, as well as forgiving old German pens). Richard Binder, before he left that line, did something called a Condor nib amendment, rolling the supra-feed part of the tines downward to create a useable broad back on a firm point, and the "fude" points for Japanese and Chinese calligraphy will produce a similar effect at a more conventional writing angle. I'll also point out for those with vintage MBs that it stikes me as a GREAT way to remove any two-tone masking which may be on the point; try it under warning! Oh, good heavens. He's got a blog now, too. Doesn't Sailor make some speciality nibs that do this? Also, the Pilot Falcon can be used on the reverse side for broad, brush like lines.